River Valley junior Beth Gillman (25) releases a shot attempt over a Jackson defender during the first half of Monday night’s non-conference girls basketball contest in Jackson, Ohio. JACKSON, Ohio — For lack of better terms, it just wasn’t their night. 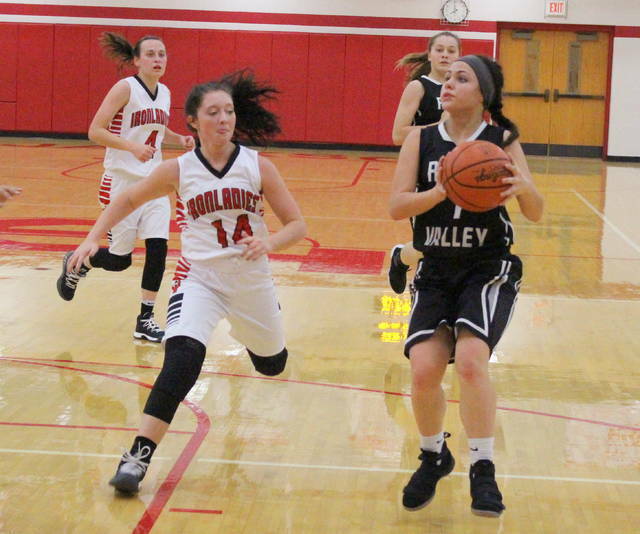 The River Valley girls basketball team committed 30 turnovers and never managed more than six points in a single quarter on Monday evening during a 52-13 setback to host Jackson in a non-conference matchup in the Apple City. The Lady Raiders (0-3) had their best — and worst — showing in the opening frame as the guests turned the ball over 14 times and also went 3-of-8 from the floor, while the Ironladies (2-0) received 10 first quarter points from senior Rebekah Green en route to a 19-6 advantage. JHS never let up from there as the Red and White made a 9-0 run for a 28-6 cushion midway through the second canto, but Jaden Neal stopped the RVHS drought with a single free throw with 3:54 left in the half to close the deficit down to 21 points. That, however, was as close as the Silver and Black would get the rest of the way as Jackson ended the half on a 10-0 surge to secure a 38-7 advantage at the break. Both teams traded a free throw apiece in the opening two minutes of the second half, but the hosts followed with seven straight points to claim a 46-8 edge with 2:17 left in the third. River Valley — after missing its first five shot attempts in the canto — finally got the ball to go in the hole with 30 seconds left following a basket by Hannah Jacks, cutting the deficit down to 46-10 headed into the finale. The guests opened the fourth with a small 3-2 run to pull to within 48-13, but Jackson closed regulation with the final four points of the night while wrapping up the 39-point outcome. The Lady Raiders — who did not commit a single turnover over the final eight minutes of play — shot just 14 percent from the field and almost had as many miscues (23) as both points and shot attempts combined (25) in the first half. “We’ve got a lot of young kids, so we just need to put this one behind us and move on because we still have a lot of basketball to play this season,” Roderick said. “Jackson played well tonight and they had a lot to do with our struggles, plus the Green girl is one of the better players we will face all year long. The Lady Raiders were outrebounded by a 39-33 overall margin, which included a 15-5 edge on the offensive glass. Jackson also committed a dozen turnovers in the contest, with nine of those coming after halftime. 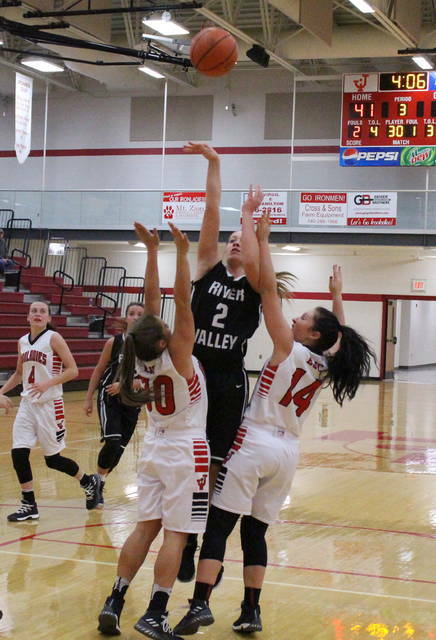 River Valley was 5-of-36 overall from the field, including misses on all seven of its three-point attempts. The guests were also 3-of-7 at the free throw line for 43 percent. Kelsey Brown led the Silver and Black with five points, followed by Hannah Jacks with three points. Savannah Reese and Beth Gillman were next with two markers apiece, while Jaden Neal rounded things out with one point. Neal and Carly Gilmore each hauled in seven rebounds in the setback, while Jacks and Brown respectively grabbed six and five boards. The Ironladies netted 21-of-65 shot attempts for 32 percent, but missed all 12 of their trifecta tries. The hosts were also 10-of-18 at the charity stripe for 56 percent. Green — who became Jackson’s second-leading all-time scorer in girls history Monday night — posted a game-high 31 points, followed by Marley Haynes with a double-double effort of 11 points and 10 rebounds. Elizabeth Fout was next with four points, while Reagan Hall, Taylor Evans and Raylene Hammond completed the winning tally with two markers apiece. Fout also hauled in eight rebounds and Green grabbed six boards in the triumph. 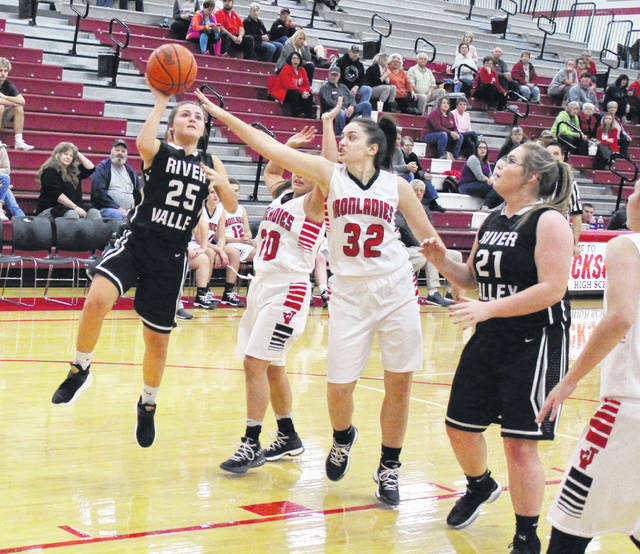 River Valley returns to action Thursday when it hosts Belpre in a non-conference contest at 6 p.m.